Cajun boudin sausage contains a seasoned mixture of pork and rice similar to a ​dirty rice dressing. Because they can be made small or large, deep-fried boudin balls make fabulous little appetizers, or add them to a breakfast, brunch, or lunch menu. 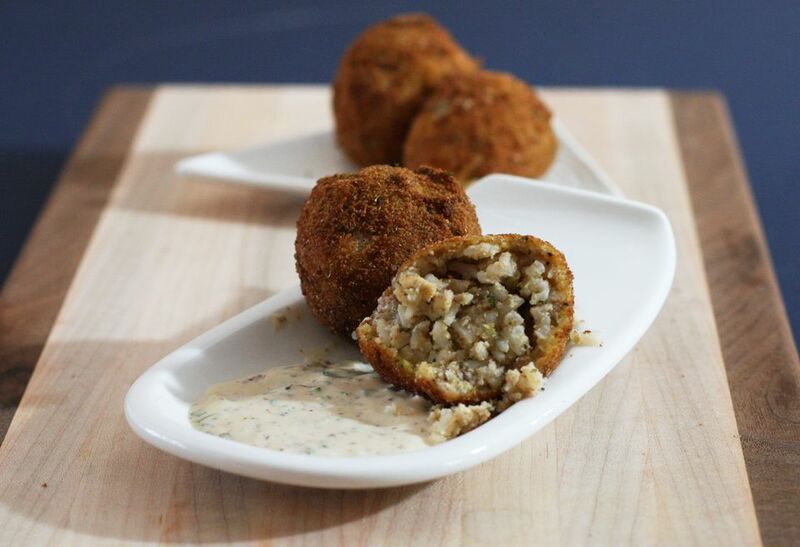 Boudin balls are also excellent as a game day snack. Serve these boudin balls with Louisiana-style remoulade sauce or with whole grain mustard or Creole mustard. Note: while there are multiple steps to this recipe, this sausage dish is broken down into workable categories to help you better plan for preparation and cooking. In a bowl, combine the mayonnaise, Creole mustard, ketchup, lemon juice, celery, green onion, parsley, cayenne pepper, and black pepper. Blend well. Cover and refrigerate while you prepare the boudin balls. Heat the oil in a deep fryer to about 360 F to 370 F.
Remove boudin from casings and crumble. Shape the boudin into 1 1/2-inch balls. The heat from your hands will help hold them together. If they stick, moisten your hands slightly. Fill one small bowl with flour, another with eggs, and a third with breadcrumbs. Then coat with the beaten egg. Then gently roll in the bread crumbs to coat thoroughly. You'll need to rinse your hands several times as you prepare the boudin balls. Fry the balls, two at a time, in the hot oil until golden brown. Serve with the remoulade sauce or with Creole-style mustard.